The Frank Vogel NBA Indiana Pacers Crunch Time Plays are a great collection of plays designed to get your three man involved in the offense. I think that you will like the Frank Vogel NBA Indiana Pacers Crunch Time Plays plus the post-up set plays. The world is full of dreamers and doers, but rarely are they the same person. Many have passion, but few have the persistence and dedication that they need to turn their dreams into reality. 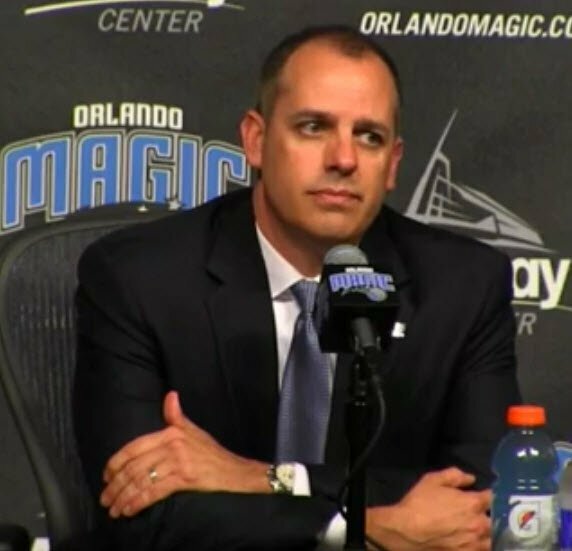 New Orlando Magic coach Frank Vogel is living the dream, that if you are willing to make sacrifices, remain persistent and positive plus you put in the tireless work, great things can happen. Coach Vogel met then Kentucky Coach Rick Pitino at a Five Star basketball camp years earlier, then Vogel showed up on the UK campus in 1994 looking to somehow become part of one of college basketball’s most storied programs. Vogel knew if he got his foot in the door at Kentucky then his work ethic, personality, and character would shine through and he would be able to make it. He got a dorm room in Wildcat Lodge, but said that he wouldn’t be there much. He would be over in the gym. Now you look at Coach Vogel and he is one of the most highly regarded coaches in the NBA, and his work ethic and positive approach remain the very same. His rise is an unlikely one, but his success is not, because he has always been a driven and focused person that was determined to make his dreams come true. The Orlando Magic saw the passion and perfection that Vogel brought to the job and they jumped at the chance to hire him to be their next coach. Orlando is confident that the positivity of Frank Vogel will mesh well with a young roster and help this NBA Franchise back to the play-offs for the first time in four years.